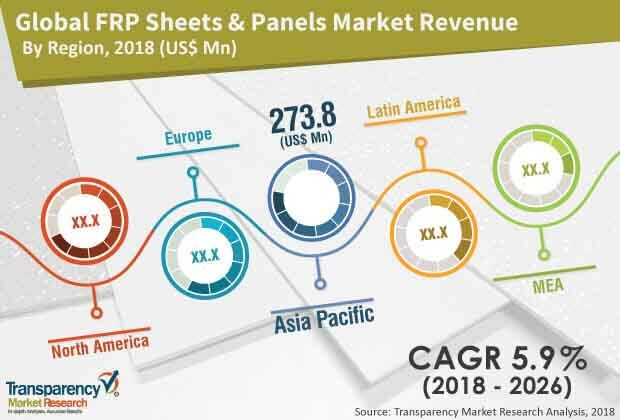 The global FRP sheets & panels market was valued at around US$ 5.0 Bn in 2017 and is anticipated to expand at a CAGR of approximately 6.0% during the forecast period, according to a new report titled ‘FRP Sheets & Panels Market: Global Industry Analysis, Size, Share, Growth, Trends, and Forecast, 2018–2026’ published by Transparency Market Research (TMR). The global FRP sheets & panels market is driven by the increase in demand for these sheets and panels in power plants. FRP sheets and panels are used in a wide range of applications in the construction industry, due to their reduced weight, limited requirement for supporting structure, and excellent resistance to corrosion. Furthermore, lack of need for maintenance and repair work in buildings is fueling the FRP sheets & panels market in the construction industry. The FRP sheets & panels market in Asia Pacific is expanding at a significant pace, led by the rise in demand for these sheets and panels in transportation applications in the region. Automotive manufacturers and OEMs are seeking innovative materials to reduce vehicle weight and achieve fuel efficiency and carbon emission targets due to the implementation of stringent environmental norms and government regulations. Composites offer several structural and weight advantages over traditional steel and injection molded automotive parts. These are used as raw materials to manufacture various structural, interior, exterior, and other automobile components. Composites offer high stiffness, tensile strength, temperature tolerance, low weight, and thermal expansion. Therefore, they are preferred in the manufacture of automobiles. Demand for electric vehicles is rising in the automobiles industry. This is anticipated to boost the demand for composite materials, thereby augmenting the demand for fiber reinforced composites in the automotive industry. In the 1990s, the constitution of composites used in building an aircraft was approximately 10% of the total weight of an aircraft. The usage of composites in aircraft construction has increased due to the continuous research & development activities. The percentage of composites used in an aircraft rose by up to 40% by 2010. Utilization of composites in aircraft surpassed 50% of the total weight of an aircraft by 2015. The global aerospace industry is expected to expand at a rapid pace during the forecast period. Consumption of composites, primarily CFRP, is projected to rise due to the increase in production of aircraft during the forecast period. In terms of application, the global FRP sheets & panels market has been divided into building & construction, transportation, electronics & electrical, consumer products, aerospace, and others (including sports & leisure, marine, and wind power). The transportation segment is projected to dominate the market. The segment is expected to expand at a significant pace from 2018 to 2026. In terms of region, the global FRP sheets & panels market has been split into Asia Pacific, Europe, North America, Middle East & Africa, and Latin America. Rapid urbanization in developing countries such as China, India, and Mexico is boosting the demand for new construction. This, in turn, is propelling the demand for FRP sheets and panels in these countries. Key players covered in this report are Stabilit Servicios S.A. De C.V., Crane Co., US Liner Company, Enduro Composites Inc., Brianza Plastica S.p.A., Optiplan GmbH, Polser Fiberglass Reinforced Plastics Inc., and Panolam Industries International, Inc. These companies operate across the world. This helps them establish control over the entire value chain and sustain their leading position in the market.